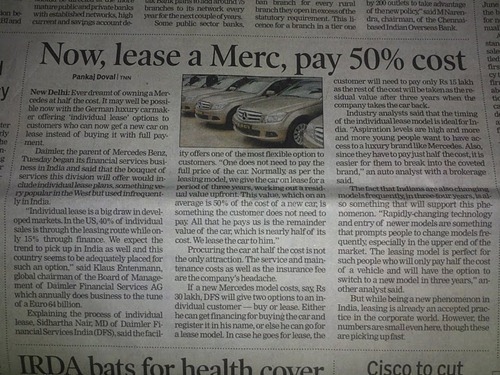 If you have read the Business Page of Times of India today – you must have come across a title saying “Now, Lease a Merc, pay 50% cost”. It probably is dream come true for many as you can have pleasure of having a Mercedes car at half the cost. In western countries, Car Leasing is very popular – Infact, half of all people who do not pay upfront, lease their cars instead of opting for full financing. I have personally leased a car for a period of 2 years, so I do have certain knowledge of it. Let me first explain the concept of Leasing the car – Simply put, if a consumer wants to lease a car, he has to pay only a certain percentage of the car price (generally about 50%). You have freedom to then use the car for a period of 3 years (sometimes it is more, depends on lease) after which you have return the car and you owe or own nothing. Thats where car lease ends. What is attractive here is – All the car maintenance and the car insurance costs are borne by the company itself. Car Leasing becomes even more attractive to consumers when this car lease cost is allowed to be paid in monthly installments during the lease tenure. What this does is relatively negligible upfront costs to the person taking the lease. Here is an example – Lets say the car costs 30 Lakhs and the car valuation after 3 years is expected to be 16 Lakh, then consumer will lease the car for 14 Lakh. Now, this 14 lakh is to be paid over 3 years, so the person leasing the car will have to pay close to 39,000 rupees every month for next 3 years. Other than initial costs / security deposit, buyer does not have to pay anything other than monthly installments! What Mercedes is introducing in India is something very similar. As per the ToI news, Mercedes will be starting a financial arm, through which they will be leasing out Mercs. Because leasing cars entails higher risk to auto company, credit rating & credit history are thoroughly checked before car lease approval takes place. It may happen that if your credit rating is weak, you may be asked to pay higher initial security deposit! However, there are couple of very important points that buyer should understand before leasing the car. Generally, Car lease agreement has a cap on number of kilometres / miles you can drive in a year. If you go above that limit, you are charged a standard fee per kilometer. Buyer should always check if there are any additional (hidden) fees charged except for excessive miles & damages. Is Car Leasing beneficial from consumer point of view ? This is really an individual choice – It has its obvious advantages and disadvantages. If you drive a lot and you are unable to keep the mileage within the specified limit, then it may work out expensive. However, it works out very well for cars who do not get good resale value. It also works well for people who do not want to pay large upfront down-payment. What do you think? Will the Car leasing concept get popular in India as it is in the western countries? the lease I am given to understand is about 96088/- per month for C200CGI for 36 months with a buyback option residual value of Rs.16,00,000 at the end of the term. Which I thought was a bum deal. Mercedes enters the car leasing industry in India..
@mercedes-Benz India you guys to respond to user queries! Do u have more info about Car leasing options for individuals in NCR? Good one. Yashwant Jhabakh could you please explain how the indian model for leasing spans out. All the classes I.e C, E, M are covered under this scheme? Mercedes-Benz India could u please elaborate as to how the leasing model spans out in india. Upfront costs, limitation on models etc….